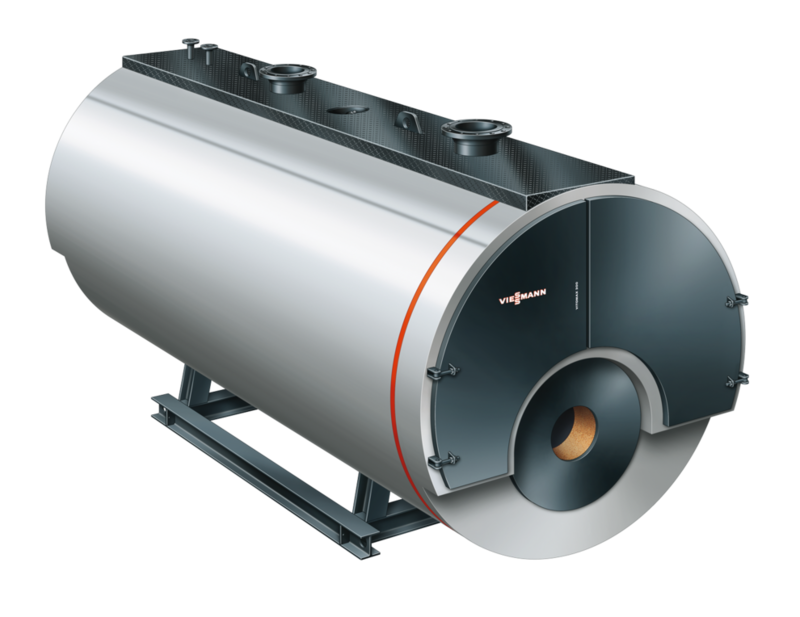 Industrial hot water boilers are ideal when you need a large-scale heating solution for your premises. They provide you with dependable, cost-effective heat and can be scaled to suit your precise requirements. Viessmann’s commercial water boilers are designed to provide energy efficient, clean heat and they offer impressive operational reliability and system availability. These features are essential for heating centres in large industrial plants and buildings. Our industrial hot water systems can accommodate a wide range of customer specifications, so regardless of your heating needs, we will have the right solution for you. With their cutting edge design and configuration, our Vitomax range of industrial hot water systems can be used across a wide range of applications. To help ensure you get the right industrial water heater for your premises, we offer thorough consultations. Thanks to the many design features specific to Vitomax commercial water heaters, as well as our extensive knowledge and experience in building large industrial boilers, we are able to ensure a long service life, outstanding quality and high levels of operational reliability. Our comprehensive product range includes hot water boilers up to 20 MW. Ideal for commercial and industrial premises, and municipal offices, our low pressure hot water boilers use natural circulation, meaning there is no need for additional pumps to force the circulation of water. Our high pressure water boilers have permissible flow temperatures of up to 150°C and can easily be adapted to a variety of commercial and industrial applications. All of our Vitomax industrial/commercial boilers are designed for clean and efficient water heating with minimum emissions. When you choose a Viessmann hot water boiler, you can rest assured you’re benefiting from the very best. Our energy efficient heating systems are in use around the world, including in major projects, and they are helping companies to minimise their energy spending and lower their carbon footprints. The commercial hot water boilers in our range feature the latest in heating technology, defining the quality benchmark for other manufacturers. They are made from high grade materials and are designed and built to be long-lasting. The unique design and configuration of Viessmann hot water boilers allows them to deliver the best possible conditions for meeting individual customer requirements across a broad range of applications. The Vitomax family of commercial hot water systems are trendsetters in the medium and large output range and include a variety of advanced features, meaning that no matter how complex the project requirements, we can supply a boiler that precisely meets your specifications. Our comprehensive product range includes hot water boilers up to 20 MW. Heat generation for commercial buildings accounts for the largest proportion of energy consumption, and our advanced systems can play an important role in helping you to reduce your costs. The hot water boiler systems in our range are designed to be highly energy efficient, meaning they could save you significant sums on your energy bills. A low pressure hot water boiler for permissible flow temperatures up to 110°C and constant temperature operation that is ideal for commercial and industrial premises and municipal offices. An oil/gas high pressure hot water boiler for permissible flow temperatures up to 150°C with a heating output range of 8.0 - 16.5 MW. Easily adapted to individual specifications.